I only came across the play about three years ago and immediately thought it would make for a good theme, if only because it is the source of the saying ‘cloud-cuckoo-land’. I had just driven some solvers mad trying to find birds in a Listener (The Other Letter) so filed it in my ideas folder to tackle later. On top of that I wasn’t really sure how to play it out. Fast forward a couple of years and I decided to try out QXW having read a number of good reviews from setters; I normally use Crossword Compiler and am very happy with it. The first thing that struck me was how easy it is to create words from clashes. In fact my first reaction was that it is too easy and ruining the art of setting. I soon came off my high horse and accepted that it just meant we can use it as a tool but go beyond what it can do itself. I decided to have a go at The Birds using QXW with the challenge that the first letters of birds formed from clashes would have to leave real words, and would have to spell out the theme above a cloud-shaped CLOUD-CUCKOO-LAND. Furthermore the grid would have to be Ximenean in respect to the dearly-missed Radix to whom I owe so much. It did prove quite a challenge, and I won’t embarrass myself by admitting how long it took me, but when I did manage it I still felt perhaps I could do a little more so introduced IRIS, the interloper. I really liked the idea of having IRIS interlope and have solvers evict her, as in the play, but I wasn’t sure whether to just have her evicted from the grid, or moved to outside that city. I settled for the latter simply because it would prove that solvers knew who they had evicted. I am not sure whether that was the right decision or not as replacing an arbitrary word (GRIP) seemed a bit weak. Initially I had ATHENS in full in the centre at the bottom of the grid, however, when making some adjustments to remove a couple of accidental birds I realised that it contained HEN. I thought it might be amusing if the HEN had gone to the city in the sky and I glanced at the top part of the grid, which at that stage would have been pretty much impossible to change, to see that I had YSHEND as an entry – it was clearly meant to be! It took quite a bit more tinkering to arrange the bottom part of the grid so that it would contain real words with ATHENS in full, not necessary I know but I like such touches. Finally a bit more tinkering to remove yet another accidental bird in the bottom part of the grid – it is odd how easily thematic material you don’t want can appear by accident in a grid, yet thematic material you do want is hard to fit in! I thought the gimmick to provide ARISTOPHANES in the clues had to be the same thematic gimmick as the clashes in the grid. Unfortunately I couldn’t find a bird beginning with I that anagrams to one word, but I decided it was still better sticking with it than introducing a different gimmick. The clues went through the editorial process with few changes, which is testament to the generosity of Roger and Shane on my earliest submissions. When I look at the comments on my first Listener it is a wonder it wasn’t rejected, but instead they went beyond the duty of editors to explain in some detail many of the nuances of Listener clueing. I am very grateful. My thanks to Artix and Dysart, who are terrific testers. My thanks too to all the solvers who took the time to write comments; they are really appreciated. Until the next one hopefully. Wan’s previous Listener was two years ago (no. 4416, Up to 10 Items?) and was about spanakopita, crappit-heid and a few other (less interesting) food items. This week, we had quite a long preamble, which wasn’t surprising since there seemed to be an awful lot going on in the grid. Two cities represented, some clashing cells and extra words in some clues. My first guess was that we were dealing with Sodom and Gomorrah. I can’t believe how long it took me to solve 1ac Fairy about in El Salvador’s forests (6)! The fairy was obviously PERI, but I didn’t suss in as wordplay fodder (as opposed to indicator) for some time (PERI about IN + ES). Although the Weasly in 6ac was almost certainly RON, HONORARY would have to wait. However, 18ac Feral rats vie for scraps in Scotland (4) led to TAIVERS which obviously wasn’t a 4-letter word! So clashes were multiple letters. In fact, what took a bit of time to realise was that the contribution of one entry in a clash was frequently just one letter. Thus, PINERIES clashing with TETRADS resulted in TETRADS surviving intact and giving 1ac as PITIES. And what with a few extra words to contend with, not to mention Wan’s tricky and excellent clueing, progress was pretty slow. In all, I found a dozen extra words, which were all jumbles of thematic words. I think low was the first one that I identified since there aren’t too many anagrams of that. Owl was the culprit and an examination of the other extra words that I had identified (OK, there was only one — Wan’s for swan) meant we were dealing with birds. What’s more, the clashes could also be unjumbled to give birds, such as tern and heron in row 1. In full, they gave Tern Heron Emu Barb Ibis Rail Diver Smew. CUCKOO in 8 stood out like a sore thumb, but I wasn’t too sure what to do with it. It needed the first letters of the birds unjumbled in the clues to point me in the right direction, and it wasn’t Alfred Hitchcock: Ani Rhea Icterid Swan Tarsel Owl Pyet Hagden Avocet Nhandu Eyas Soar giving Aristophanes and his play The Birds. Reading Wiki revealed the two cities involved: CLOUD CUCKOO LAND and ATHENS to be found, respectively, in a squashed U shape across the centre of the grid and in the bottom row. Thus it contained above it all the cells with clashes. Finally, the interloper ISIS had to be moved outside (below) the city walls to replace GRIP at 35ac. Even more finally, ATHENS had to lose its thematic HEN in the grid. DEAL, FAT, COURS, UNDER were the new words revealed by these final movements. My favourite clue in all of this was Pet fish whip the cat when scrapping I [hear] (6) for CODDLE, especially since I hadn’t heard of the expression whip the cat (for IDLE) before. Thanks for a very enjoyable puzzle, Wan. Two of the harder clues in this tough puzzle by Wan got me writing ‘Crikey!’ in the margin alongside them! More than one group using translator for the French in phoned-in notices (7). 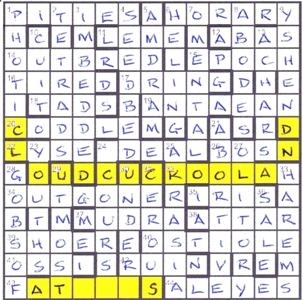 You may recall that, in this puzzle by Wan, some clues contained an extra word to be removed before solving, which made the solve harder as one didn’t know if such a word existed in the given clue. In this case it didn’t, but when solving one didn’t know that! Eventually the crossing letters in 2d suggested that the above’s answer might be TETRADS, defined as ‘more than one group’. It still took me a while to parse the rest of this, namely as TELE-ADS (phoned-in notices), but with the LE (the French) replaced with TR (abbrev. for Translator). Like any substitutions in clues, they are much easier to work out once you have the original (pre-substitution) word – here TELE-ADS – in front of you! The puzzle eventually yielded the playwright Aristophanes and his Cloud-Cuckoo-Land, with Athens down at ground level (with its HEN having gone elsewhere). Hidden birds in that land in the sky were replaced by their first letters and the ‘interloper’ from the Preamble, IRIS, was ‘thrown out’ and moved to replace 35ac. Great fun – thanks Wan! Before even beginning to solve, we checked Wan’s list of Listener puzzles on Dave Henning’s Crossword Database and found an interesting range of topics from the table of elements, via cookery to birds. This one, from the preamble, sounded literary but was clearly not going to be about Dickens’ novel – that would be too obvious. I didn’t need to read far to confirm his continued adherence to the Listener Setters’ Toping Outfit. ‘With gallons shifted, taste cider, it only passed (7)’ That was a tough clue to solve, as were most of the others but we worked out that it was GOUT with the G(allons) moving to give OUTG then ‘only’ giving ONE so OUTGONE was ‘passed’. There were two extra words there ‘cider, it’ and TEA told me that those anagrammed to ICTERID. Were we in for birds again? Wan was shifting cider (gallons of it) and shortly afterwards we found ‘Tempers lost indeed after alcohol (6)’ (not surprising after all that alcohol, Wan, Cheers!) It was ALE this time and YES for ‘indeed’, giving us a ‘lost’ word for ‘tempers’, ALEYES. There was a delightful clue that really warmed my heart as, a couple of weeks ago I was rather distressed to see that Poat had managed to shoot the poor little HARE and finally do away with him but clearly Poat is a rotten shot as there he was, in four letters in a straight line. ‘Puts clothes on male in females’ quarters (6)’ HAREMS had to be the answer and we worked out that PUTS is HAS (the BRB says so!) and that word was clothing RE M(ale). The surface reading is lovely too – what is that fellow doing in the harem? Another superb clue was ‘Who prepares Wan’s horse? (5)’ We extracted a SWAN (another bird!) from that clue and found that ‘horse’ anagrammed to SHOER. A magic &Lit. clue. I wonder whether anybody managed to complete the top half of this crossword before the bottom half. I doubt it! We were lucky in that ANI, RHEA, ICTERID, SWAN, TARCEL, OWL, PYET, HAGDEN, AVOCET, NHANDU, EYAS and SORA gave us Aristophanes (yes, we guessed that after half of those birds appeared and we hunted in the clues for the ones to complete what had to be the name – then used Wikipedia to give us THE BIRDS). Of course, that told us about CLOUD CUCKOO LAND which was already almost complete in the centre of our grid and the FAT HENS and S of CEROUS provided the other city from the play. AT(HEN)S. We had, after a couple of hours of solving, the grid half full and just a few words in the other half. But then the struggle began and we almost gave up in despair as many of the clues led to words that just didn’t fit the cells available or seem to match the definitions at all. Take BOSN. We guessed that that had to be the answer as it intersected with ACHARS but the clue seemed to be spelling out BOWMEN. ‘300 ladies moving west, some on boats (6)’ (B = 300 + WOMEN with W(est) moving – another spectacular clue! ), so we had an extra WME in the clue, where we should have had an S. Light dawned – that gave us SMEW! and we had to enter the first letter of the bird, so S. This was a real challenge and we spent a couple of tantalising hours hunting for potential clashes to provide the letters of THE BIRD, leaving, of course, real words when we extracted the clash letters. PINERIES gave us PITIES when the TERN was allowed to fly out. HONORARY gave us HORARY when the HERON waded out. DIALING became a mere DRING when the rail flew. And there we were. What a compiling feat. Thank you, Wan. Last year, Aedites used a slightly well-known quotation as his theme — you know, that one from Hamlet! I wondered if this week’s theme would be equally famous. 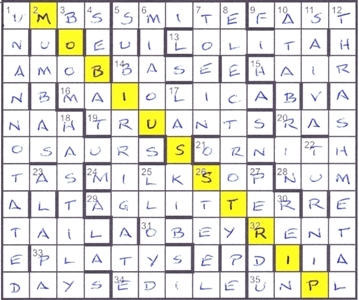 Every clue contained a misprint, and 1, 6, 8 and 12 down were all top-to-bottom 11-letter entries. 1 Taunton dean comes to farm form, without any comments (11) was a straightforward anagram leading to UNANNOTATED. It was only when it went in that I found that no across entry started in that column. However, I did notice that the entries on the other side of the grid had entry lengths that were double what was available. I wondered if the instruction to be revealed by the misprints would require us to wrap the grid around into the form of a cylinder with entries on the right of the grid wrapping round to the left. NUMNAH at 20ac put paid to that since it didn’t meet with an N at the beginning of its row. 5 Wasp Wash underground for all to see involved in Italian police scandal? (11) was another easy down entry with those nice Italian police beginning SB… and leading to SUBIRRIGATE. 8dn and 12dn, the other 11-letter entries weren’t solved particularly quickly — ELECTROTYPE and THRASH METAL. 21ac ORNITHOSAURS across the middle (right then left) did help. It was only when I got to UNPLUMBS at 35ac that I sussed what was actually happening. Entries on the right continued in their diagonally opposite spaces. In the case of 35ac, that was at 1ac. That sorted, the grid came together reasonably quickly. There was still a bit of a hiccup for me though. I had guessed that the first part of the instruction from the misprints read Enter in the grid. Of course, this bore little relationship to the corrections that were actually required in the clues, and anyway it seemed a somewhat trite thing to say. It took a bit of time for me to see that we needed Explain the grid followed by highlight eleven letters. Thus the grid represented a MOBIUS STRIP opened up. This is (à la Wiki) “a surface with only one side (when embedded in three-dimensional Euclidean space) and only one boundary”, a discovery attributed to August Ferdinand Möbius (1790–1868).